What's Happening So Far At League Meets? The rain put a damper on some of the meets scheduled during the first three days of our league championships, but it didn't effect a multitude of Bay Staters from making a strong impact out on the trails. Here's a quick recap of what's happened so far. In the no-surprise department, St. John Prep's Tristan Shelgren established a new meet record at the Catholic Conference Championships. Shelgren won the race by nearly a minute, covering the five-kilometer course at Franklin Park in a time of 15 minutes, 42 seconds.. Xaverian Brothers' John Mariano was second at 16:39. Teammate Dylan Raimondi was third in 16:43. As a team, St. John Prep had all five of its scoring runners among the top 10 to beat second-place Xaverian Brothers, 31-46. Boston College High's Marcus Lespasio (fourth, 16:47) and St. John's Derek Walsh (fifth, 16:54) and Jack Dwortz (sixth, 16:59) cracked 17 minutes. In another runaway victory, Arlington Catholic's Sean Kay took individual honors at the Catholic Central Championships on Thursday. Kay won the race by a minute with his time of 17:03. Arlington Catholic took the team prize, too. The Cougars defeated runner-up Bishop Fenwick, 43-55. 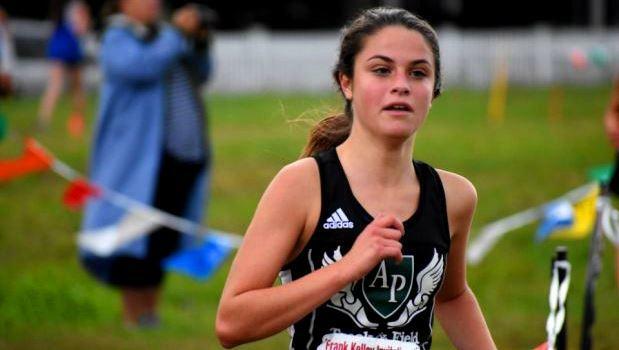 Stephanie Casaletto led Austin Prep to the girls' title, breaking the tape in 19:23, a whopping 1:41 ahead of her closest pursuer. Austin Prep beat Bishop Fenwick by a slim 42-45 margin. The Parker Charter Essential School boys swept the top six placements in the Colonial Athletic League Championships to easily bring home the team plaque. Sydney Korhonen won the race with a time of 16:07.99. Parker Charter also claimed the girls' title with Phoebe Von Conta crossing the line first in 20:46.48. MIlbury's Vincent Didomenica held off Oxford's Jared Orrell to take gold in the Merrimack Valley Conference Championships. Didomenica was timed in 16:02.70 to Orrell's 16:04.30 effort. With all five of its varsity runners among the top 10, Uxbridge beat Millbury, 33-59, for the team crown. Freshmen Stephen Sanches (16:35) and junior Ryan Semle (16:42.70) went 3-4 to lead the Spartans. Uxbridge also won the girls' title, but it did it based on a sixth-runner tiebreaker. The Spartans were deadlocked at 59 with Grafton with their five varsity harriers. Abigail Hamilton of Grafton won the race with a time of 18:48.8. Finishing second was promising seventh-grader Emma Ronan of Northbridge, who finished with a very fast time of 18:54.1. It was a clean sweep for Concord-Carlisle at the Dual Valley Conference Championships. Newton South's Caroline Barry was first in the girls' race with a time of 18:59.60, while Lincoln-Sudbury's Sophi Defreitas was second in 19:25.20. The C-C girls took the next five placements to claim the No. 1 slot. Sarah Reichheld led the charge, finishing third in 19:48.90. Westford Academy's Jason Dolan captured the boys' race, running 16:17.90. Concord-Carlisle's Zander Kessler was second in 16:21.70.